An easy to install, beautifully lit product that turns your boring pinball machine hinges into lighted works of art! V1 Is The Text Edition. An available V2 would be a Silhouette Edition of This Hinge Cover Product! Other colors available. We regularly stock this hinge in just one color, the color listed above, but if you want it in one of our other 7 colors, we will custom make that for you for an additional $10. Just select your custom color from the drop-down list, and please allow an extra couple of days for processing your custom order. Give your games a custom look with Lighted Magnetic Hinge Covers! Light up your game hinges with an amazing lighted enhancement! Whether your game sits by itself or are in a row of many games, our Lighted Magnetic Hinge Covers are visible from across the largest venues. This mod is one of the easiest mods you will ever install. Lighted Magnetic Hinge Covers dress up a part of your pinball machine that has been neglected forever. The difference is so dramatic, it will be one of the first things people see when they look at your machine. Nobody ever notices their pinball back box hinges, because they are just black blobs that detract from the artwork on the side of your games. Backbox hinges have never done anything to draw attention to them, so everyone has just learned to accept them in their plain, boring state. That has now changed, introducing our Lighted Magnetic Hinges Covers!! 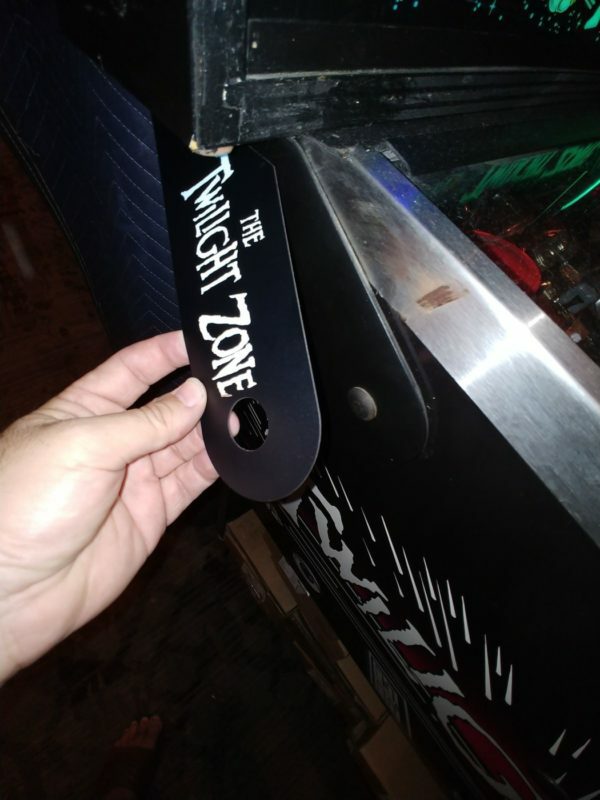 Now you can get the custom look laser etched and lighted hinges for far less than the cost of having these custom made, and with an installation time of about 10 minutes, they are very easy to install. You will be amazed at how visible these are on your game. Because hinges are so boring, nobody ever notices them, but they are always visible. Even if you have your games pushed so close together that there is only an inch between them (as so many of us do), you can see Lighted Magnetic Hinge Covers from any place in your room. When your games are sitting next to each other, you may not be able to see the back box art, because those are right next to each other. You may not be able to see the side art on your game, because between the side of one game to another is 6 inches. BUT, because the hinges are on the top of your main cabinet, and 6 inches away from your next game, you can see the hinges from any place in the room. 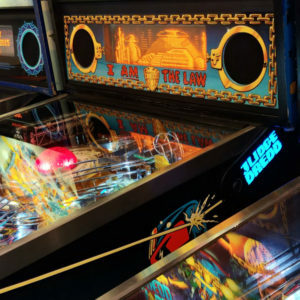 Please do me a favor- go look at your games, you will see you can see the hinge to every pinball machine in your game room. When you looked at those pinball machines, did you notice how boring those hinges are? Time to dress them up. 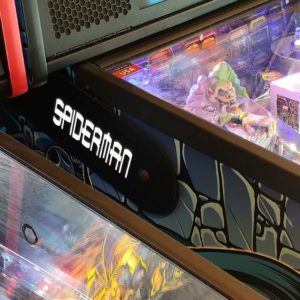 Lighted Magnetic Hinge covers are one of the easiest pinball mods that you have ever installed. Lighted Magnetic Hinge Covers have a magnet sheet on the back, and an electroluminescent panel (EL Panel) in the center. In addition, they are covered in outdoor grade vinyl to give a custom look. The Lighted Magnetic Hinge Covers are custom cut to fit exactly the size of your hinge. There’s a small factory fit hole in the hinge to make room for the pivot point, so they’re calibrated to your game. They are as easy to lay on your back box hinge as placing a magnet on your refrigerator! Our Lighted Pinball Hinge Cover Kit comes with absolutely everything needed to install- including your pinball title-specific power tap that offers a female and male plug so you won’t lose a connection in your game. 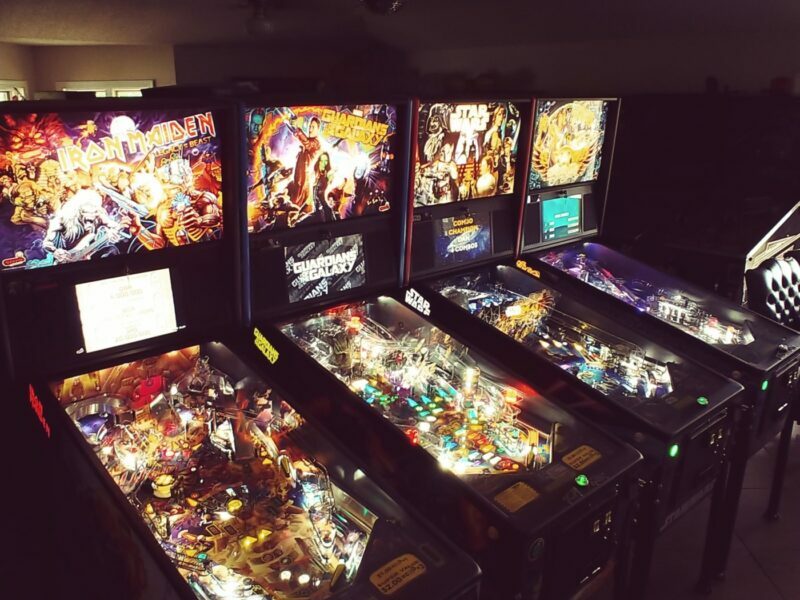 Power consumption is very low,to give a rough estimate, they use about the energy of a single incandescent light bulb found in older pinball machines! 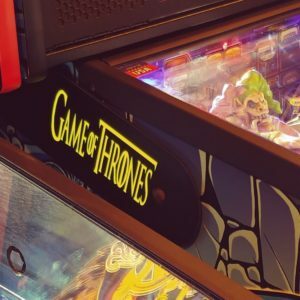 For our advanced pinball enthusiasts, the exact power consumption at 12V is 0.24 Amps for Stern and Sega, and 0.18 Amps for Bally/Williams and Data East Hinge Covers. *Because we are custom making this product for you, please allow roughly an additional week of shipping/handling time for a custom color. *Every mod is quality hand crafted, therefore, there may be very slight variations. 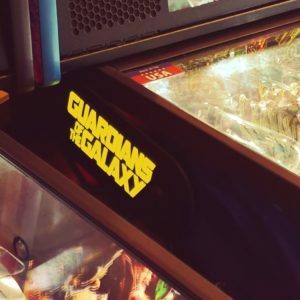 Disclaimer: As this is a custom modification for a pinball machine, I cannot make any guarantees or warranties that there will not be any unintended side effects during or after the installation of my mod. 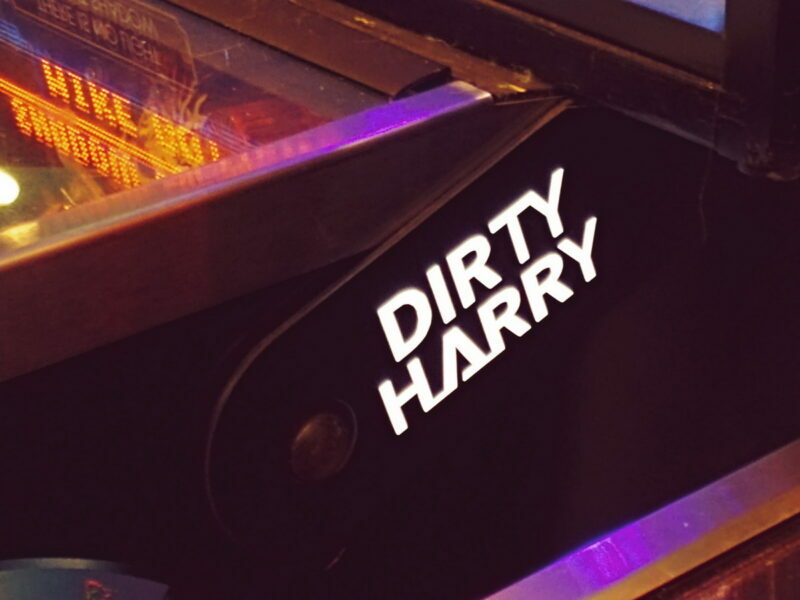 This is not a factory original or approved part for your pinball machine. 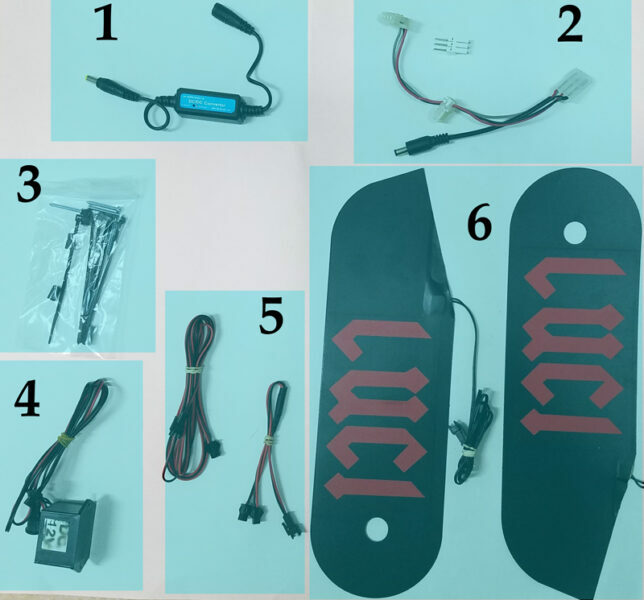 I have taken care to test this product to the best of my abilities, however it is your responsibility to make sure the mod is installed correctly. Even so, I cannot assume responsibility for game malfunction, damage to the game or surroundings, personal injury, or any other adverse effects caused by the installation of my mod. Picture of 4 Stern games with Lighted Magnetic Hinge Covers are to demonstrate the visibility of the Lighted Magnetic Hinge Covers installed. Like our Lighted Hinge Covers? Get the "Any Color" upgrade for free! Coupon Code for a limited time.